This cannot be dressed up, the stage is a bore. We will only see action in the final 20km. The cat 4 climb makes the finish complicated for some of the sprinters. You need to ignore the official figures of 4.35km at 4.2% and take the climb in 500m sections. The first 500m is easy, then we get 8.8%, 7% and 6.2% for the next three sections. 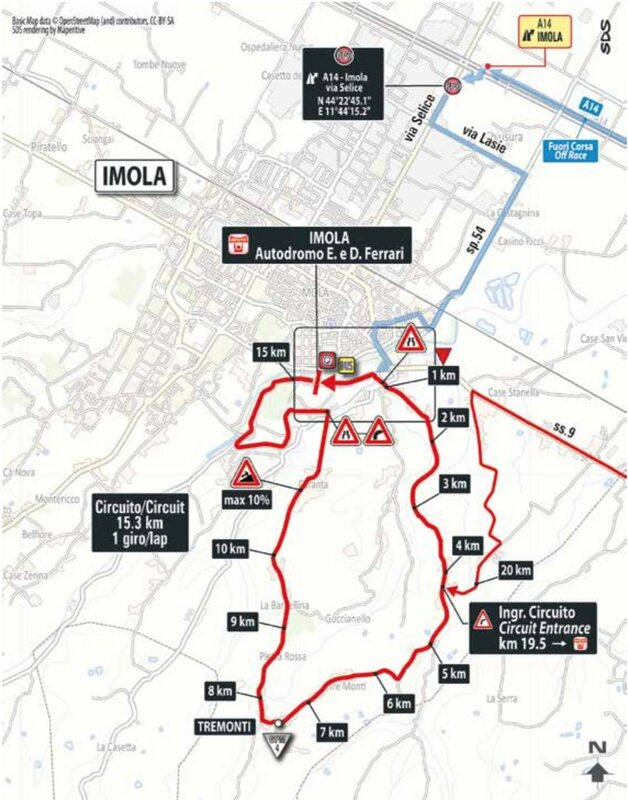 The following 1.5km is downhill or almost flat and then the road kicks up again for the crest, with 7.4% and 7.7%. Once the climb has been crested, we have 7.6km renaming and it’s downhill, nearly all the way. The descent is easy and without difficulty. The riders then head back onto the racing circuit for the sprint finish. There is a chance of rain, but very little wind. Despite the climb, it will be very hard to distance the sprinters. 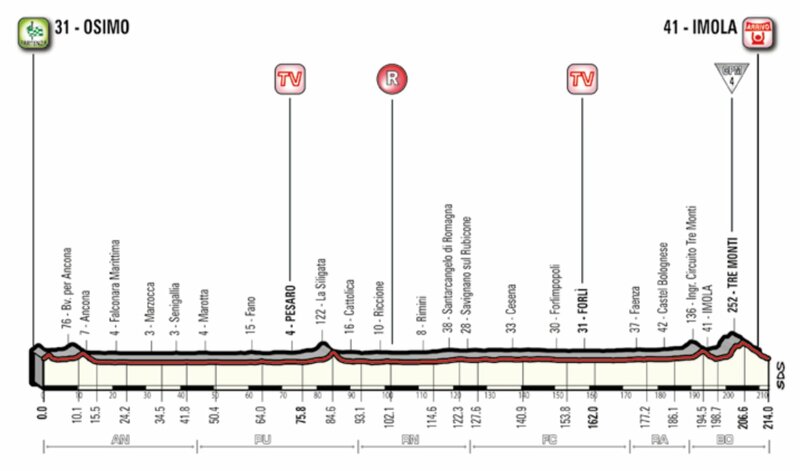 With such an easy day in the saddle, most teams will still have their sprinter and domestiques, that will make it hard for anyone to hold off the bunch in the final 5km. Elia Viviani – despite already winning two stages, the pressure is on. After losing stage 7 to Bennett, the Italian will be keen to flex his muscles. 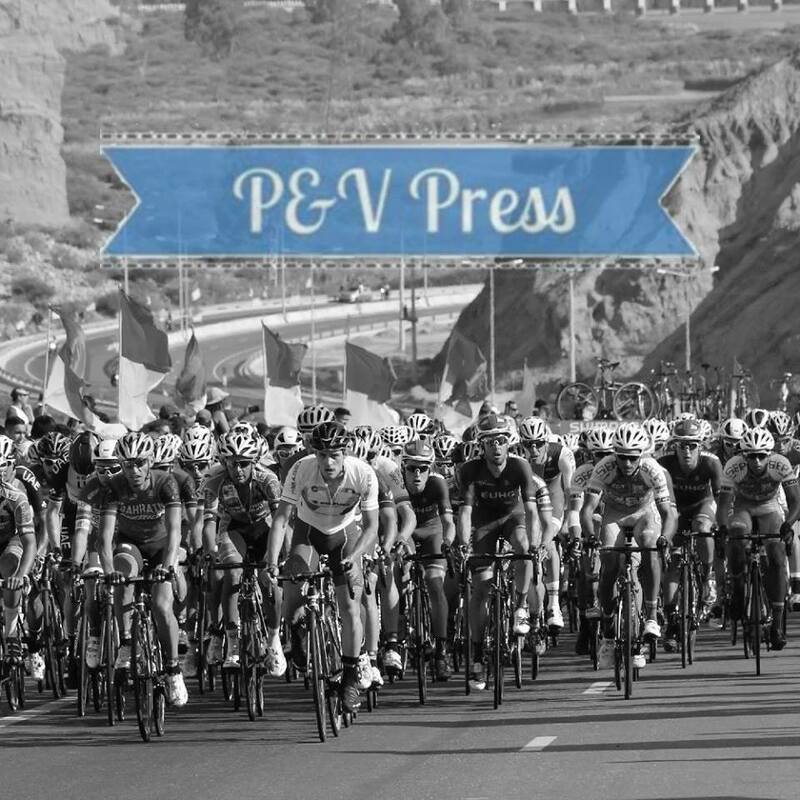 That day, his lead out train misfired, something that doesn’t happen very often. 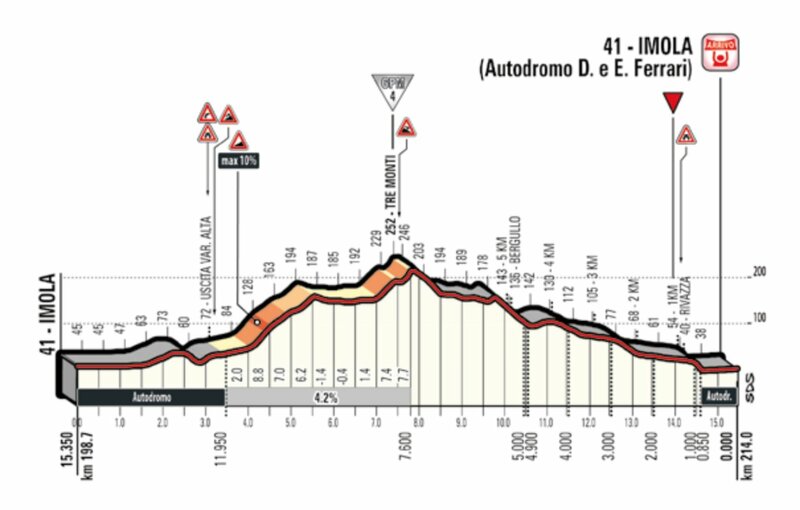 The final climb shouldn’t be an issue for Viviani, he can cope with these gradients and lengths. If QuickStep nail the lead out, he’ll be very hard to beat. Sam Bennett – after taking his first Giro win, Bennett will be full of confidence. Not only is he sprinting well, but he’s climbing better than ever. Expect to see Bora set a fast pace on the climb, trying to eliminate any of the weaker sprinters. 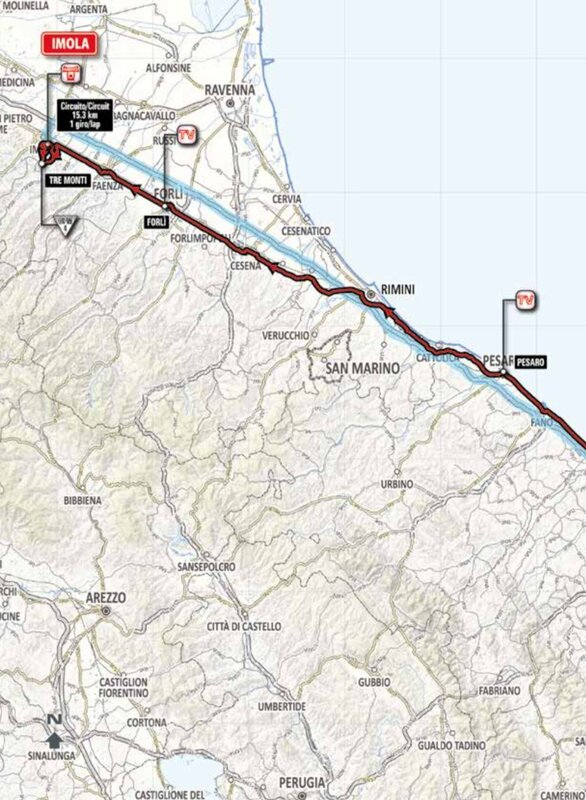 Without his lead out man, no doubt we’ll see Bennett attempt the tactic that worked on stage 7, sticking to the wheel of Viviani. He knows he has the speed to come round him, but he does need to be on that particular wheel. Sacha Modolo – he’s been knocking on the door, but just hasn’t been fast enough. The same story is true of his sprint train, they are good but not good enough. I don’t see things changing. Danny Van Poppel – back on stage 7, it was Jumbo who dominated the final 1.5km. This was very impressive from the Dutch squad, but they hit the front a little too early and Van Poppel was swamped at the end. Despite not being able to contend for the win, it should give them confidence going into this stage. Van Poppel has the speed to challenge for the win, but he needs to believe in himself. Niccolo Bonifazio – the most dangerous sprinter of his generation. When he’s around I have to watch with my hand over my eyes! Fast and reckless, some would say the perfect combination for a sprinter. He’s managed a 4th and 3rd place in the opening stages, he could improve on that in this stage. Jens Debusschere – the finish should suit the Belgian fast man. He often struggles in frantic finishes, but the climb should string out the bunch and he’ll be near the front. I doubt he has the speed to win, but he’ll hope for a top 5 performance. I don’t see the climb stopping the sprinters. In the bunch sprint, I think QuickStep will get it right and Elia Viviani will take his 3rd win of the race.